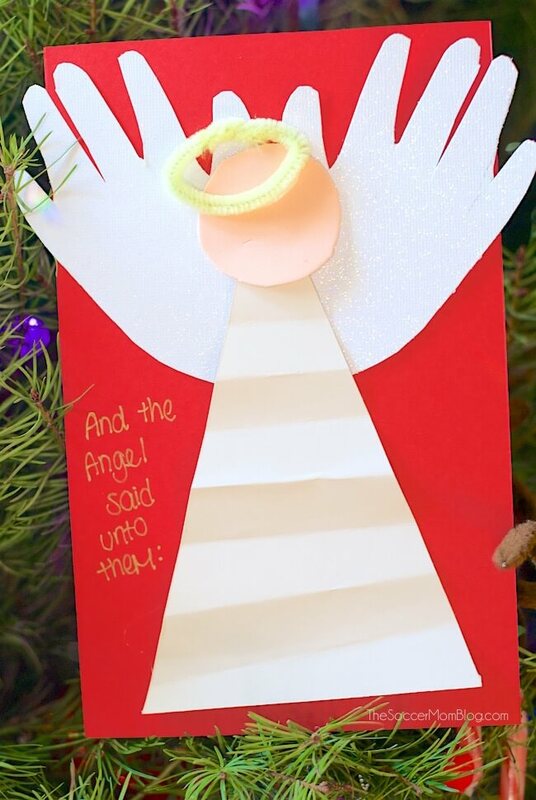 Spread good tidings with this adorable kid-made Handprint Angel Christmas Card! Believe it or not, the design for this handprint angel Christmas card came to me in a dream! I woke up the next morning and I actually remembered the handprint angel I dreamt about (and I rarely remember my dreams), so I knew that we needed to make this one. My daughter and I made our handprint angel card that very day, and it turned out just how I dreamt. I love it! 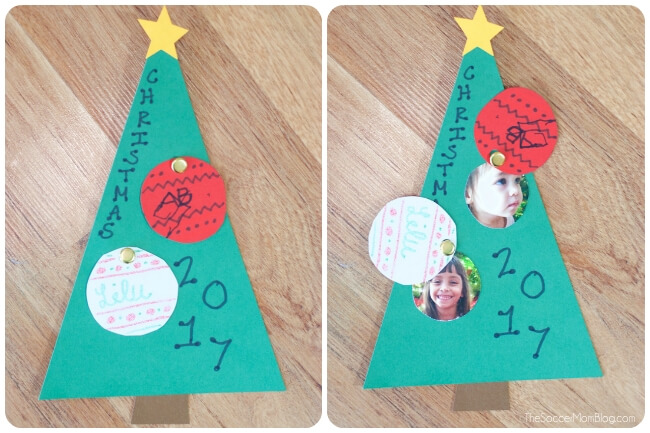 This sweet kid-made card is perfect to make for family, and it is a keepsake that they’ll want to keep for years to come! 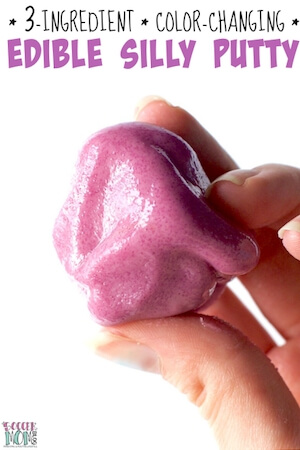 Best of all, you don’t need any fancy supplies to make it! 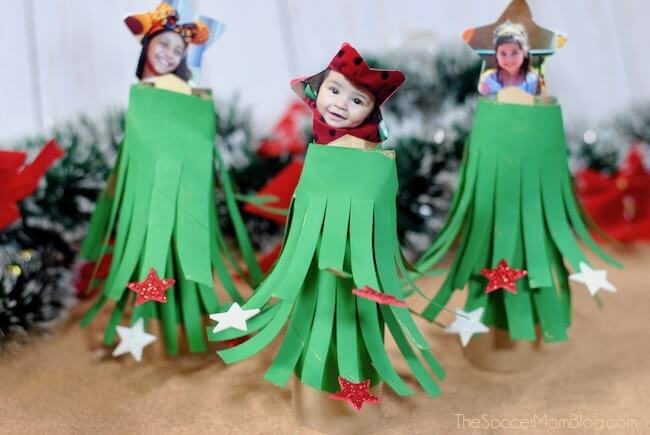 NEW: Be sure to check out our Cardboard Tube Christmas Tree craft too! 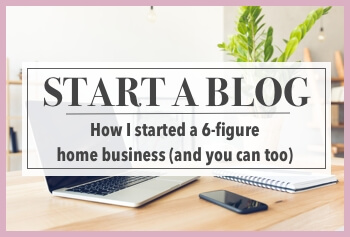 For your convenience in re-creating our handprint angel craft, I’ve included shop-able ad links to some of the products we used. Our disclosure policy is available here. 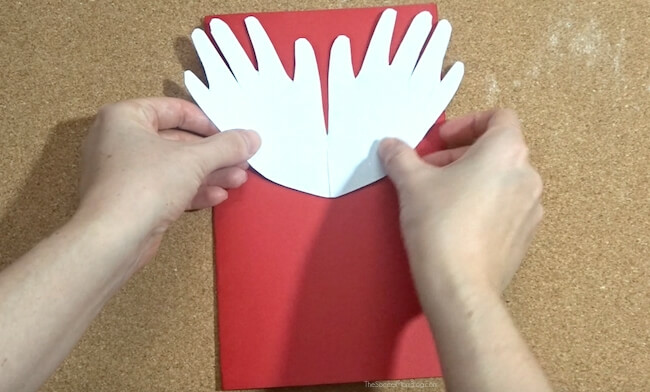 First, watch this simple 1-minute video tutorial to see how we made our handprint angel Christmas card, then keep reading for full step-by-step photo instructions. Start by folding an 8 1/2 x 11 inch piece of red cardstock in half for your card. 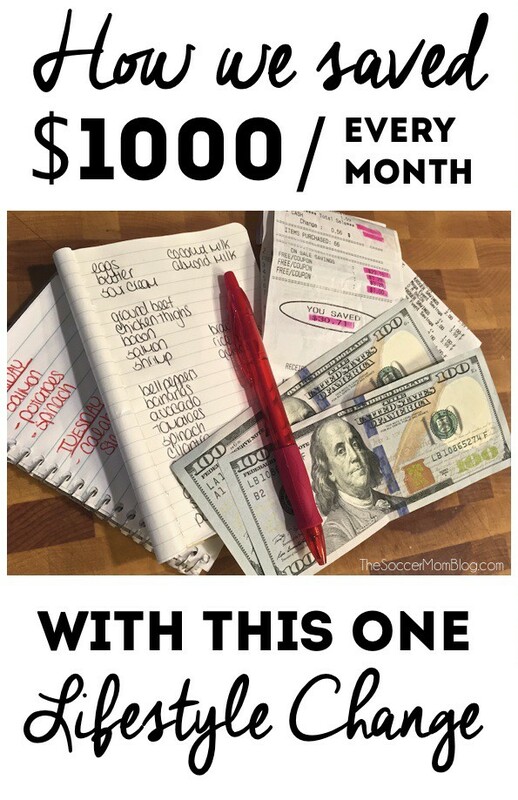 You can also use construction paper if that’s what you have on hand — I just like yardstick because it is a tad smoother and sturdier. Fold a piece of white cardstock in half and place child’s hand on top, with the wrist at the fold. 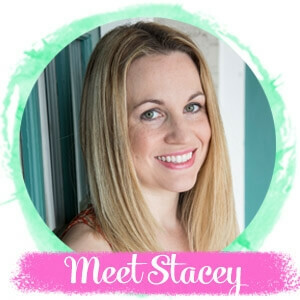 We happened to have a piece of glittery white cardstock in our collection, but you can also use plain white and paint with glitter for the same effect. Trace child’s hand and cut out. Unfold and you’ll have two handprints attached at the middle to use as your angel wings. Cut a narrow triangle out of the off-white cardstock — about 6 inches tall and 4 inches wide at the base. Accordion fold the triangle (about 1/2 inch between folds) to create texture. Cut a circle from peach cardstock or craft foam (which is what we used), about the diameter of a ping-pong ball. Create a halo using a 3-4 inch piece of yellow pipe-cleaner, wrapped around itself to form an oval. Glue the angel wings to the front of your card, with the bottom of the hands/wrist almost exactly in the middle of the card. 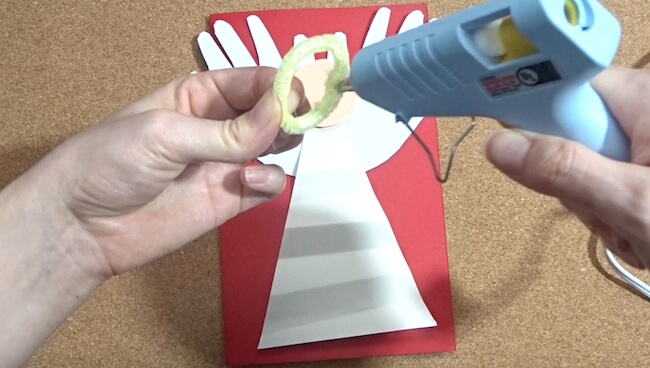 Then attach the angel’s body (triangle cardstock), head (peach craft foam or cardstock), and halo (yellow pipe-cleaner). 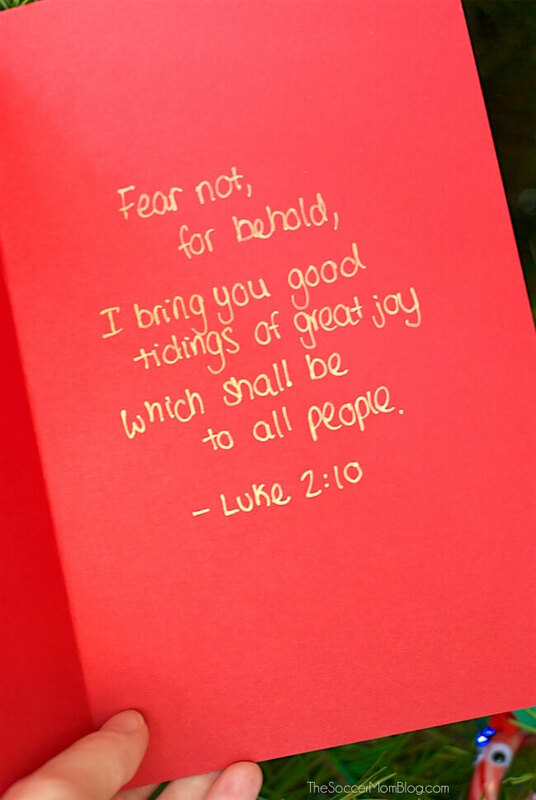 However, you are free to include any holiday message you’d like inside! I just love how this handprint angel card turned out – I still can’t believe the idea came to me in a dream! Hopefully more inspiration will happen that way! 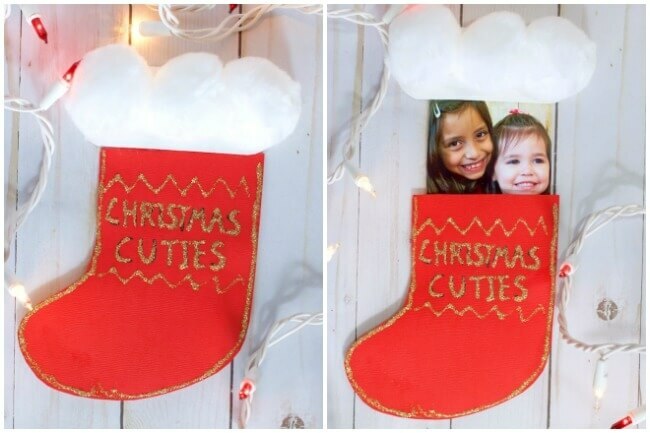 Related: Click here to see a HUGE collection of over 100 Easy Christmas Crafts for Kids! 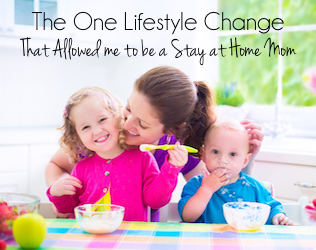 « Adult Children Living at Home — Does it Help them Save Money? Oh I love this! I am so doing this with my son. Thank u for the great ideas!